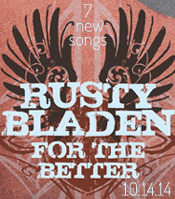 For The Better, the new album from RUSTY BLADEN, has arrived. Written by Rusty Bladen and produced by Thom Daugherty (formerly of The Band Perry and The Elms). ALBUM INFO: Bladen has recorded arguably his best album ever – a Midwesterner’s take on country and rock and roll. The mixing of Bladen’s writing (he penned all the songs) and sound with producer Thom Daugherty’s (former guitarist for The Band Perry and The Elms) gritty-but-sweet touch makes for a sound both familiar and original. 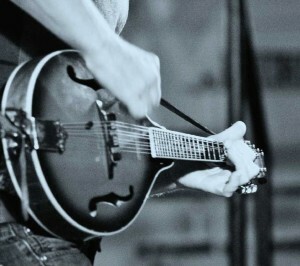 Recorded in Indianapolis, the album, in addition to Bladen’s acoustic guitar, harmonica and vocals, features Daugherty on electric guitar and former Elms member Chris Thomas on drums. The organ was recorded in a southside Indianapolis church. John McDowell, one of the original members of the band The Wright Brothers, contributes background vocals. Rusty Bladen’s song “Broken Heart, Crippled Mind” from the new For The Better album was featured by independent music website Reverb Nation in October, 2014. Bladen earned a national artist spot on the homepage based on it’s popularity among reviewers and users.